In SPO we have a couple of sites that lack a default group for the "Allow members to share this site and individual files and folders". 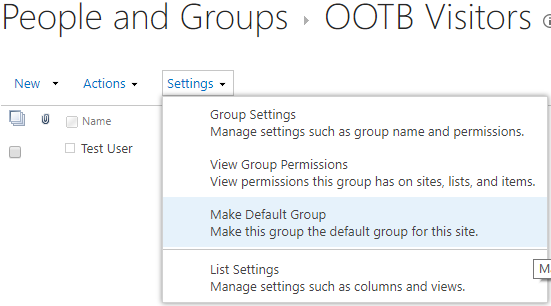 I'm trying to set a SharePoint security group named "OOTB Visitors" as the default group for this through PowerShell. However, I can't get it to work. I don't get an error message but it also doesn't change anything. I believe to have fixed it. I noticed that the first argument passed into CreateDefaultAssociatedGroups has to be a site owner present in the user information list for that site. Retrieved one via Get-PnpUser, stored the result in an object and passed it as the first argument. Note however that if the groups are already present no duplicates will be created. Not the answer you're looking for? Browse other questions tagged sharepoint-online powershell permissions groups pnp-powershell or ask your own question. SharePoint PnP Powershell - How to provision sub webs with unique permissions and default groups?